Looking for Raspberry Facts and Picking Tips in 2019? Scroll down this page and follow the links. And if you bring home some fruit or vegetables and want to can, freeze, make jam, salsa or pickles, see this page for simple, reliable, illustrated canning, freezing or preserving directions. There are plenty of other related resources, click on the resources dropdown above. Raspberries can produce an early summer crop or a late summer and Fall crop. In the U.S. Spring / Summer raspberries (called florocanes) typically peak during June in the South, and in July in the North. The primocane varieties, which produce raspberries on shoots that come up each Spring are typically read from August until frost. Raspberries are a very healthy food; packed with anthocyanins! Raspberries contain more vitamin C than oranges, are super high in fibre, lhave a good amount of folic acid, are high in potassium, vitamin A and calcium. The USDA says 1 cup of raspberries has about 62 calories. 11 cup of raspberries, not packed down weighs about 140 grams. An average raspberry has 100 to 120 seeds. Select plump, firm, fully raspberries. Unripe berries will not ripen once picked. Raspberries belong to a large group of fruits known as brambles, such as blackberries, in the plant genus Rubus. Raspberries come in red, yellow, orange, purple and black colors. In most areas, raspberries begin to bloom in late May or early June. Bumblebees, honeybees, and other wild bees love to visit brambles. 60-70 pints of fruits can be harvested from 100 feet row. 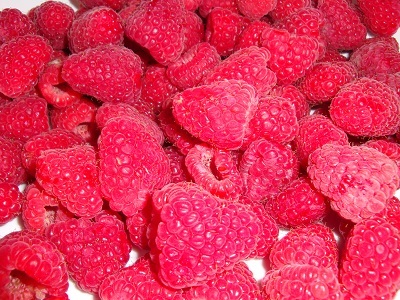 The United States is the world's third-largest producer of raspberries (FAOSTAT, 2013). Production occurs across much of the country, although most of it is concentrated in California, Oregon and Washington. California leads the nation in both black and red raspberry production (NASS, 2015). According to the most recent Census of Agriculture, the United States has 8,052 raspberry farms totaling 23,104 acres (Census of Ag, USDA, 2012). U-pick raspberry farms typically sell berries by the pound. A quart equals 1 and 1/4 pounds of fresh berries. Do the math and be careful not to over-purchase as raspberries quickly mold when left at room temperature, and only last a couple of days in the refrigerator. You can easily freeze berries that you cannot use right away - just wash, cut the hulls off and pop them into a ziplock bag, removing as much air as possible. Those vacuum food sealers REALLY do a good job of this! The berries will keep for many months frozen without air. Want to go to a raspberry festival? See this page for a list! Always call before you go to the farm - And when they are in season, a large turnout can pick a field clean before noon, so CALL first! Leave early. On weekends, then fields may be picked clean by NOON! Most growers furnish picking containers designed for raspberries, but they may charge you for them; be sure to call before you go to see if you need to bring containers. If you use your own containers, remember that heaping raspberries more than 5 inches deep will bruise the lower berries. Plastic dishpans, metal oven pans with 3 inch tall sides and large pots make good containers. I like the Glad storage containers like the one at right. Raspberry bushes don't have thorns, but they are a pick prickly, so if you want to hold the stem while picking, a pair of lightweight gloves is helpful. A ripe raspberry is deep color with a plump, soft but firm feel. It will pull free from the plant with only a slight tug. The center will remain on the plant. Keep in mind, raspberries come in many colors: red, yellow, black, purple, so you want to pick the darker shade of whichever it is. Pick only the berries that are fully ripe. Reach in between the stems to grab for hidden berries ready for harvest. Bend down and look up into the plant and you'll find loads of berries that other people missed! I find it helps to hold the stem with one hand, while picking with the other. Repeat these operations using both hands until each holds 3 or 4 berries. Repeat the picking process with both hands. Don't overfill your containers or try to pack the berries down. Ideally, the collection containers should be wide so the pberries aren't more than a few deep. Avoid placing the picked berries in the sunlight any longer than necessary. It is better to put them in the shade of a tree or shed than in the car trunk or on the car seat. Cool them as soon as possible after picking. DON'T wash the berries until you are ready to use them or freeze them. Washing makes them more prone to spoiling. DO refrigerate! Right after picking, place raspberries in the fridge. If your fridge tends to dry out produce, lightly cover the container. Raspberries don't store for very long, usually just a few days. The reason the ones from the grocery store last longer is they are covered with fungicides! Put a couple of days supply into the fridge, wash off the others, drain them and freeze them up! (Unless you're going to make jam right away) raspberries are less perishable than blueberries or strawberries, but refrigerate them as soon as possible after picking. Temperatures between 34 F and 38 F are best, but, be careful not to freeze the raspberries (while they are in the fridge)! See this page for illustrated freezing instructions. And if you want to freeze them to use later, see my How to freeze berries page. Just rinse them in cold water. I use a large bowl filled with water, pour the berries in, and gently stir them with my fingers to dislodge any dirt or bugs. Then using my fingers like a sieve, I scoop the raspberries out of the water, and put them in a drainer to let the water drain off. Then I just pour the berries into a ziploc bags or vacuum sealer bags and pop them in the freezer. After they are frozen, I remove as much air from the bag as possible and seal the bag. I have picked my raspberries and have seen little worms. Not sure if these are fruit flys that have laid eggs in them - or if they are grubs. I picked some out than froze the berries. I have heard that cold will kill them or drawn them out. If I make jam the cooked way (not freezer jam) and some of the grubs/worms are left will it hurt people? I would like to believe I got them all but fear I did not. Answer: That sounds like SWD, spotted wing drossophila, the grub or larval form of a fly. Typically, they are about 1/4-inch long. Soaking for an hour or more in salt water (1 cup of slat to the gallon), may help draw them out. Cold would probably kill them, but leave them inside the fruit. I don't imagine they would be harmful if cooked into jam... but I doubt anyone would ask for seconds if they found one. Eeeewwwwww!